This is a very exciting day for me! 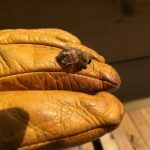 My day started at 7:30am at the Willow Hive. 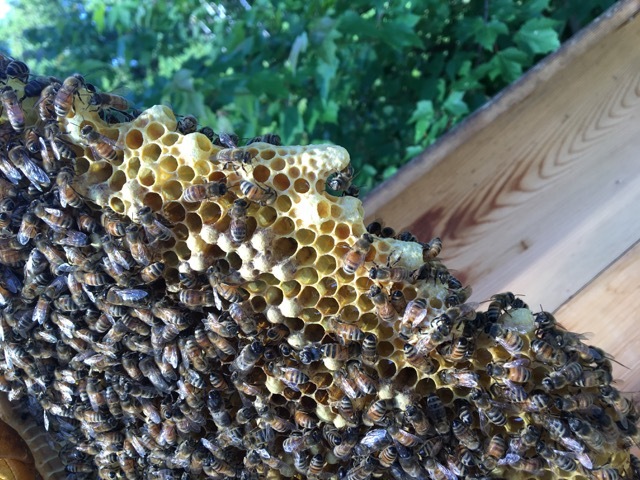 The plan was to go through the entire hive to determine if I could do a split. 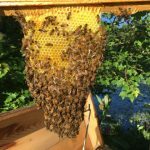 There is another beekeeper at Old Frog Pond Farm that has built a top bar hive. 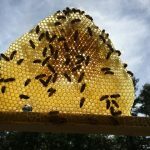 If I am able to split this colony, I will be putting the original queen and some resources into his hive. 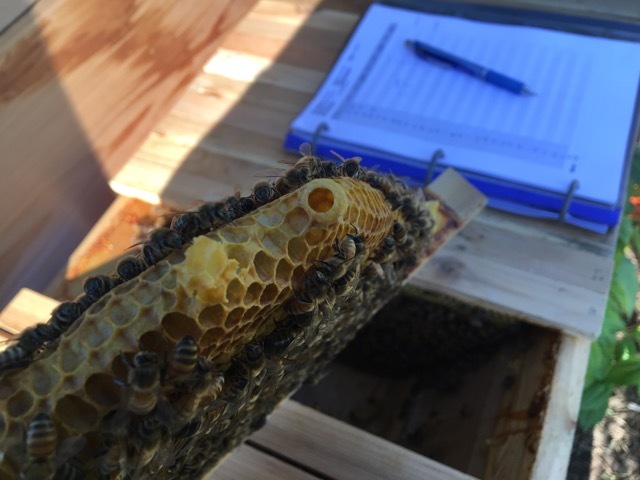 During the inspection, I will be looking for swarm cells and the original queen. 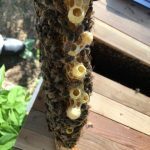 This colony is doing well and has grown quickly. They have thirty bars, two of them are empty, and four of them only have about half drawn out comb. 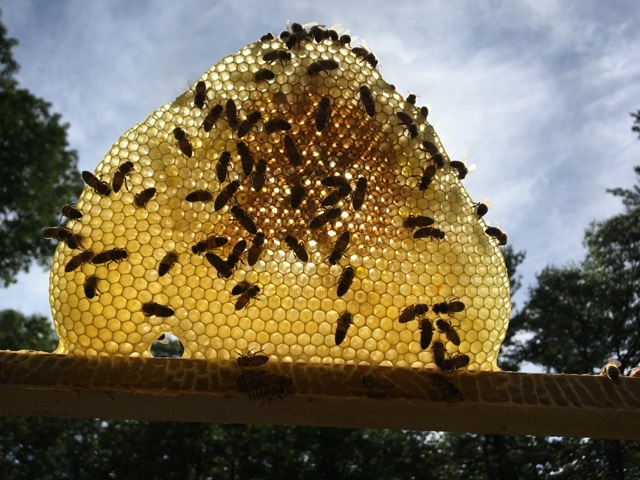 Twenty seven of the bars have nectar on them and nineteen of them have capped honey. 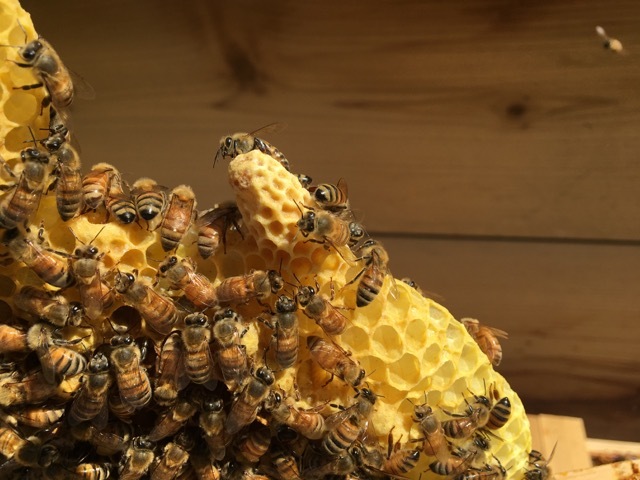 Twenty bars have capped brood, fifteen have larvae, and ten of them have eggs. 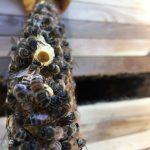 I found a whopping twenty seven queen cups! 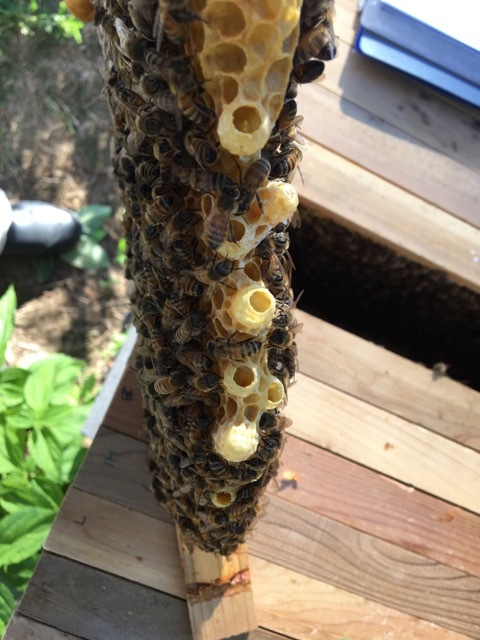 Four of them were capped and at least three of them have larvae in them. 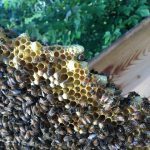 This colony was getting ready to swarm! 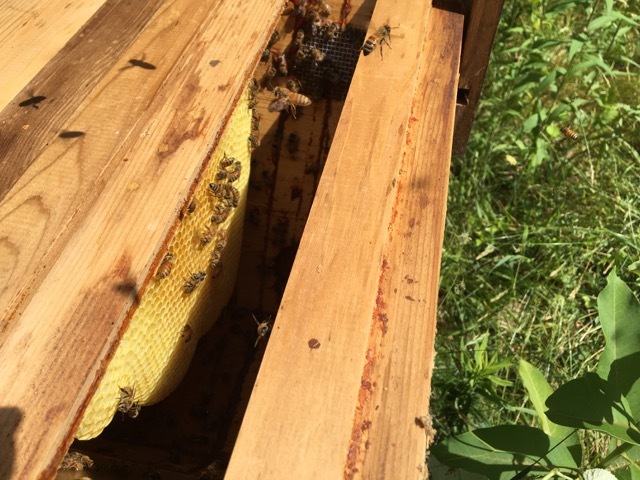 To make the split, I removed six bars from the hive. 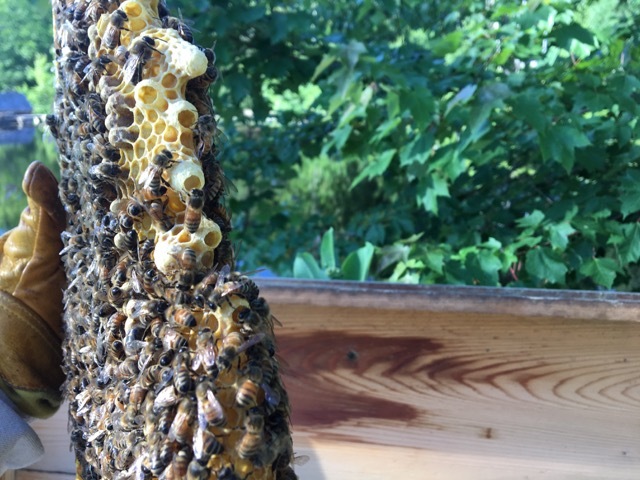 A couple of them just had nectar and honey on them, but the others had brood. I found the bar with the original queen on it toward the end of the inspection. 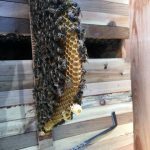 I removed that bar and put it with the others that were going to go into the new hive. 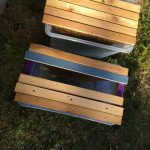 Again I used the plastic boxes that fit the bars to move them. 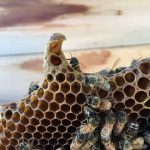 It was very interesting to see the bee’s reaction to removing their queen. 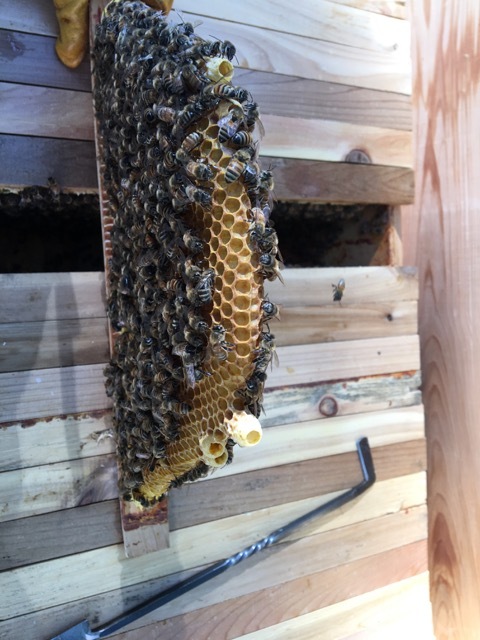 Almost the moment that I removed the bar with the queen on it, the bees became agitated. Their reaction was almost immediate. 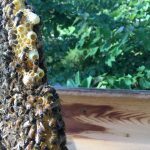 The bees knew right away that things were not right in their home. Luckily, there were only a few more bars to get through. 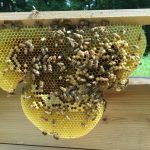 Once I finished inspecting the hive I added four empty bars to replace some of the ones that I had taken. This left them with six empty bars to build on. 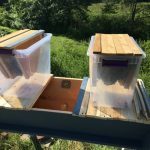 After the hive was all closed up, Don and I took the boxes with the bars that I had pulled over to his top bar hive. 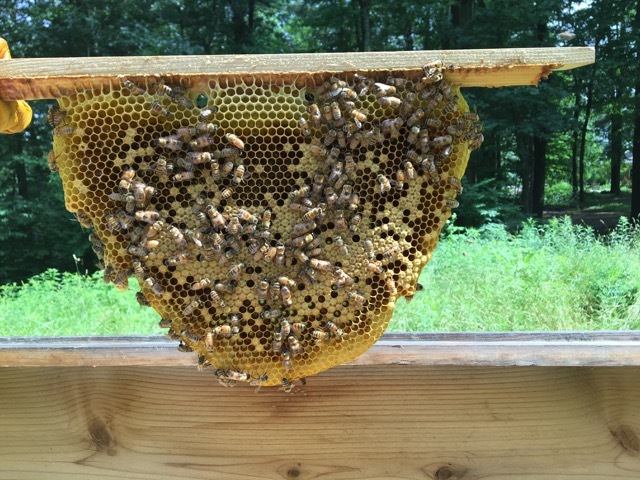 We installed the new little colony and added a few bars for them to grow on. 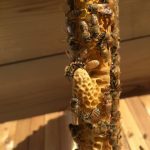 Now I just need a new queen to hatch, mate, and come back to the hive. 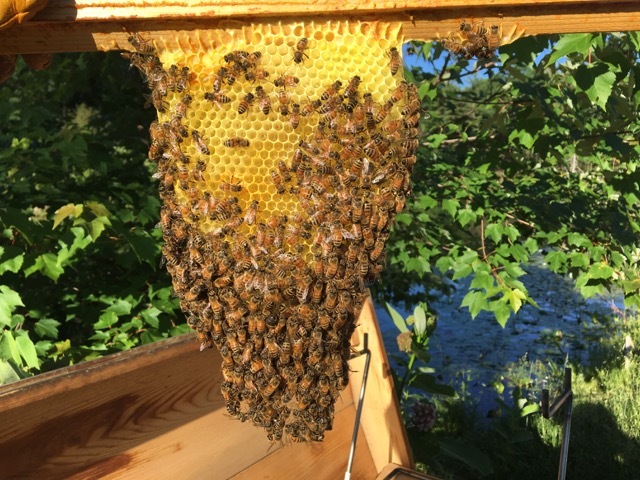 I will check on them again in about two weeks to see how their progress is. 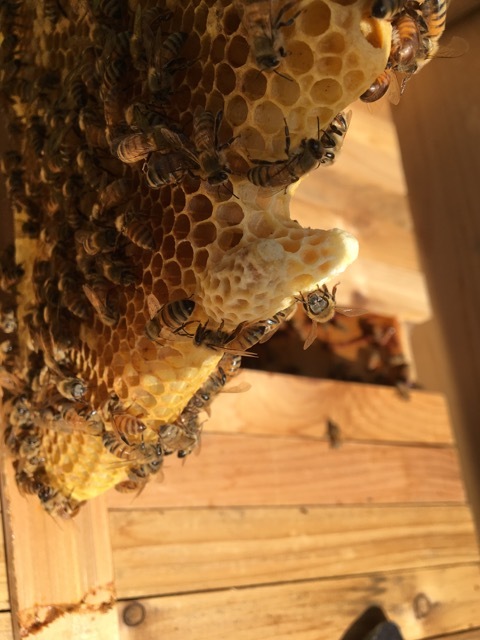 It was very exciting to do my very first hive split! 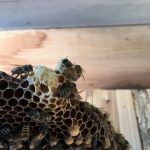 After all of that excitement I went out to the Healing Hive to check in on them. 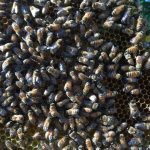 This colony has twenty eight bars, but six of them are empty and four of them only had small combs built on them. 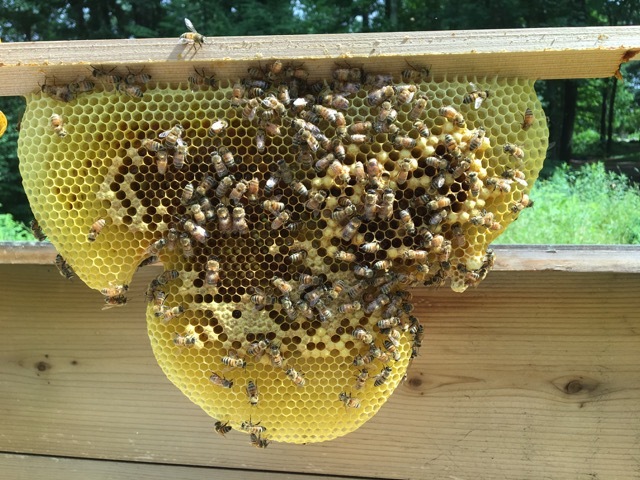 They seemed to have stopped building new comb. 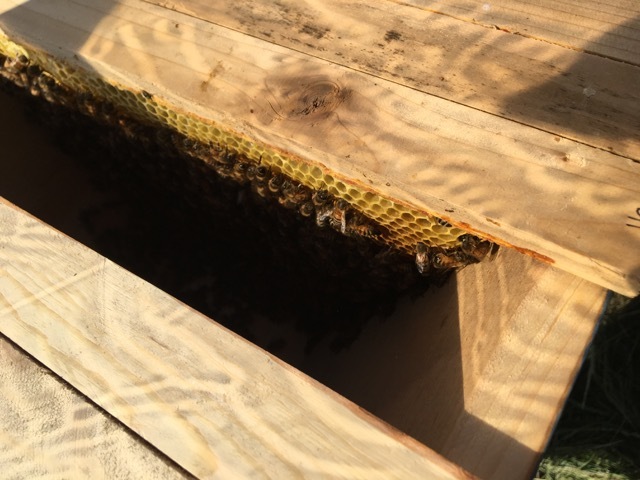 Twenty one of the bars have nectar on them, but there is no capped honey in this hive. 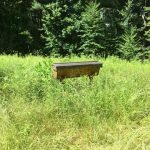 They did have nine bars with pollen stores on them, which is more than my other hives. 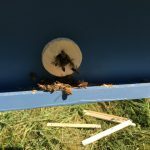 Nineteen of the bars have capped brood on them, ten have larvae, and three have eggs. 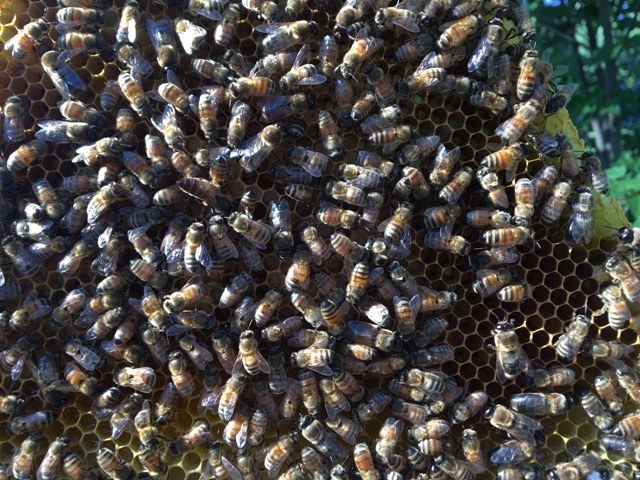 The queen has been in the hive within the last three days, but I did not see her today. 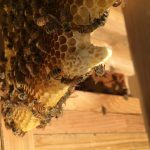 The bees are also acting queen less. They are extremely cranky! 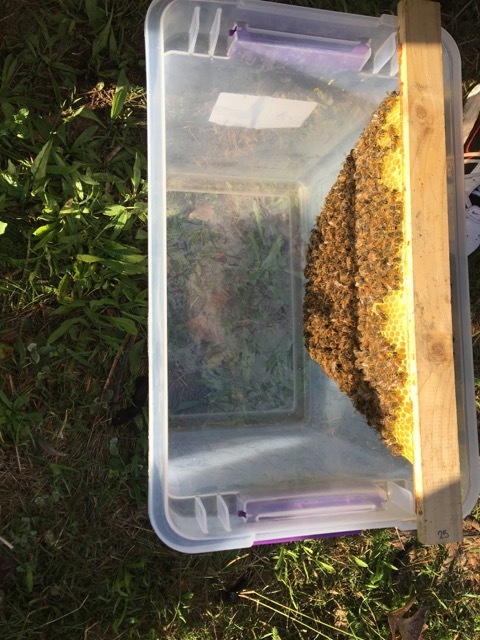 I did find sixteen queen cups, four of them were capped and at least one had a larva in it. Even though they didn’t need it, I added one empty bar for them. It will be good to see them grow more. 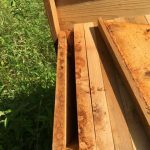 Once I closed up the hive I needed to deal with the carpenter ants that are living between the divider board and the end of the hive. 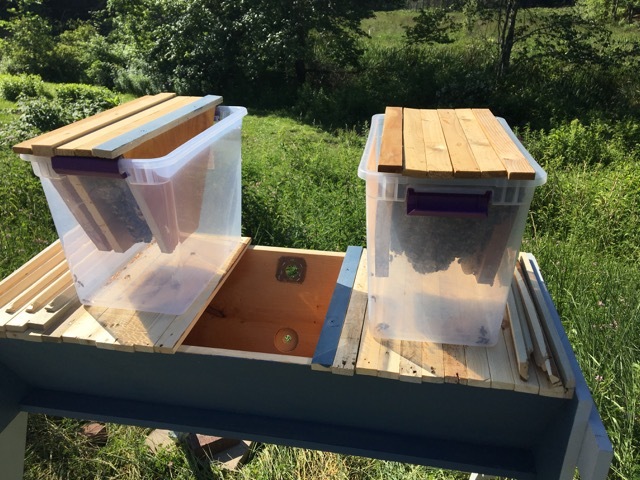 I moved the entire colony over one bar space and added second divider board on that side so that I could open the ant nest without disturbing the bees too much. When I opened up the area where the ants are I poured cinnamon on them to try to deter them from staying. They had already chewed a hole in the divider board to get into the space and I don’t want them doing any more damage. The cinnamon seemed to make most of the ants scatter and leave the nest with their eggs. I also added some peppermint essential oil to create more of a deterrent. 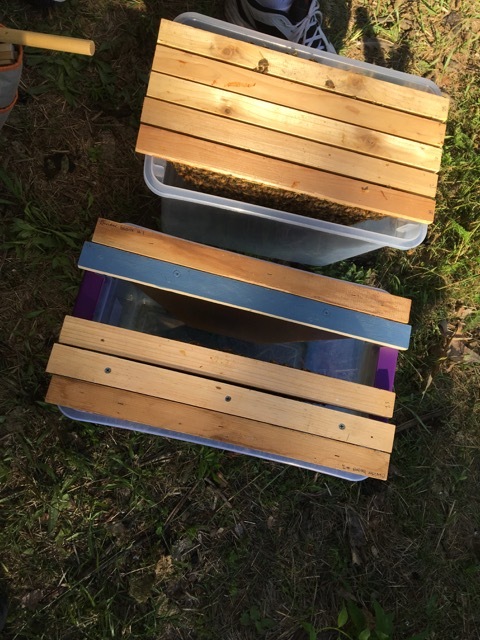 Most of them left, so I put the divider board back in and closed up the hive. 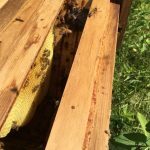 Hopefully the ants will not come back. 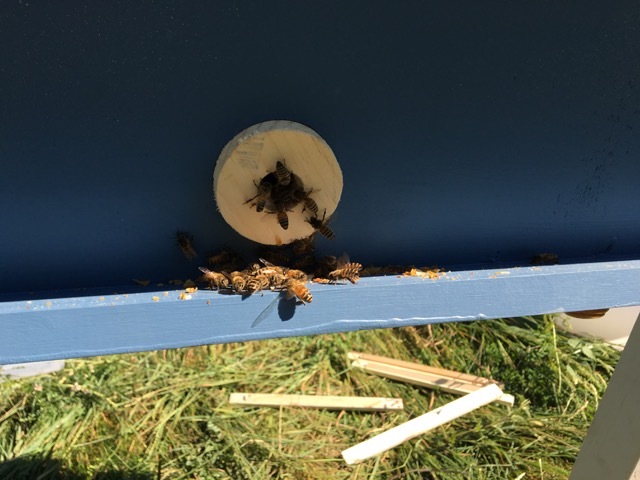 Then I was off to help another top bar beekeeping inspect her hive. 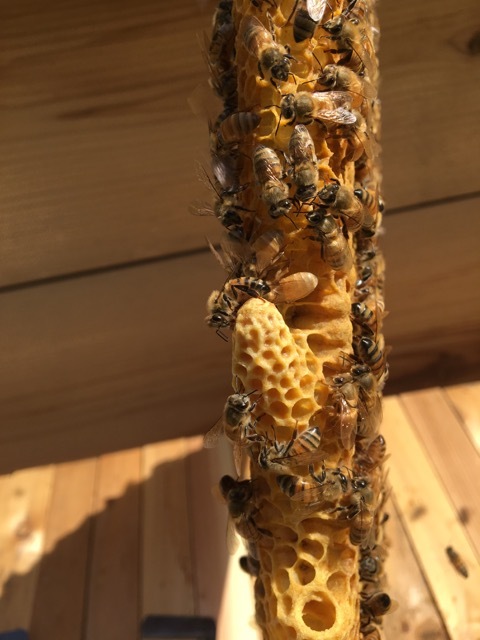 Going through her hive, I noticed that they were acting the same way that my Orchard Hive and Healing Hive had been when they were queen less. 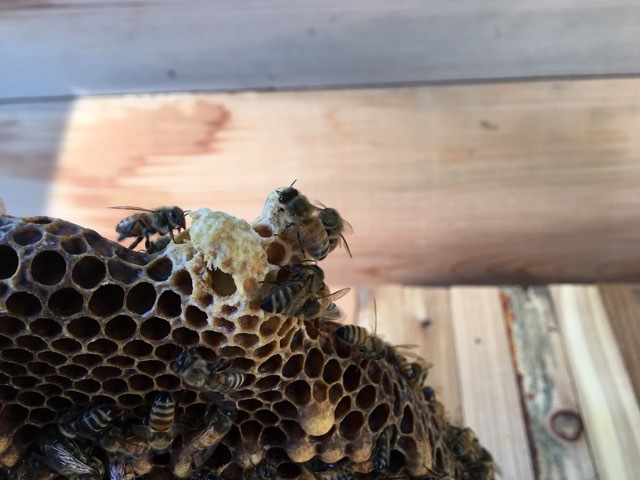 Sure enough, this colony was queen less. 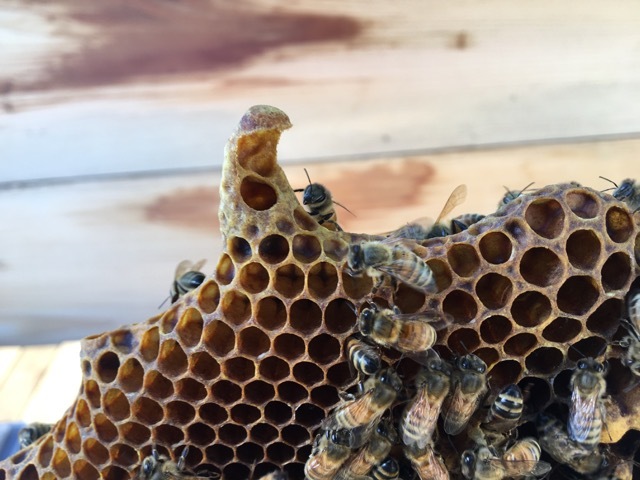 They had queen cups with larvae in them though, so they were working on replacing her. 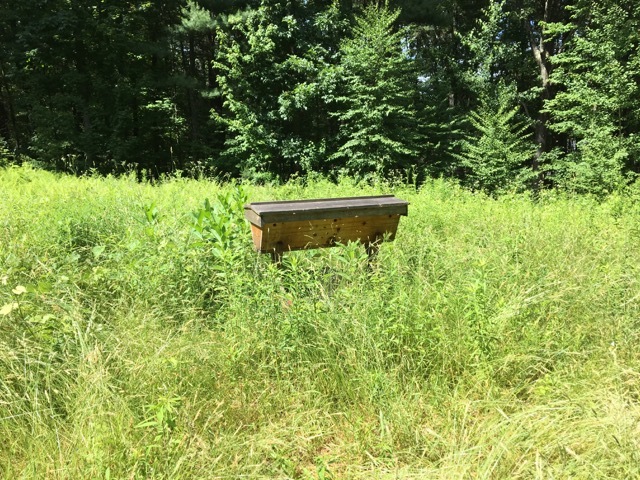 At the end of the inspection, we closed up the hive and walked a bit away from it. 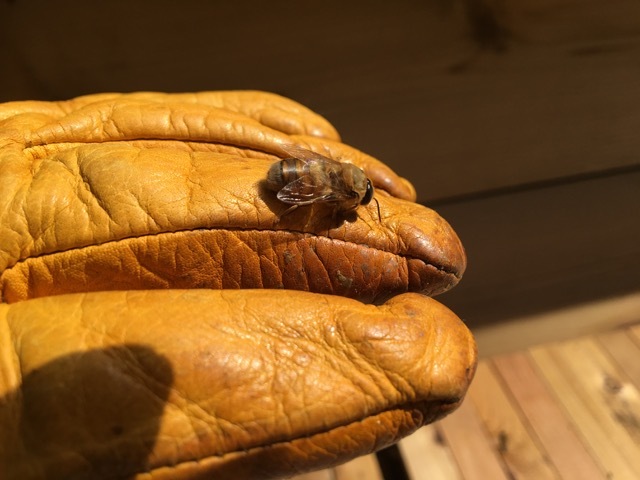 I waited a little bit to take of my bee suit hood, just in case. 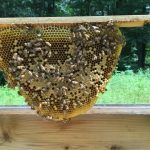 There weren’t any bees flying around me, so I took the hood off and then got stung in the face! 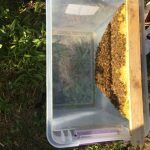 Luckily, I always have bentonite clay in my bee bag! I got some right away and added a small amount of water to it to make a paste. I put the paste on the site of the sting and left it there for about thirty minuets. The result was amazing! I used to swell up with welts the size of basketballs and it would itch and burn for a couple of weeks. This time the swelling was minimal, people couldn’t even tell that I had been stung and it only lasted about a week! I love bentonite clay! 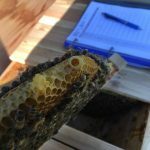 When I got home later in the day, I received a phone call from another beekeeper. 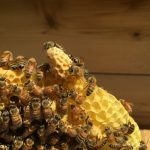 She is seeing the same thing in her hive that I have seen in two of mine and that the other beekeeper I helped today has seen. 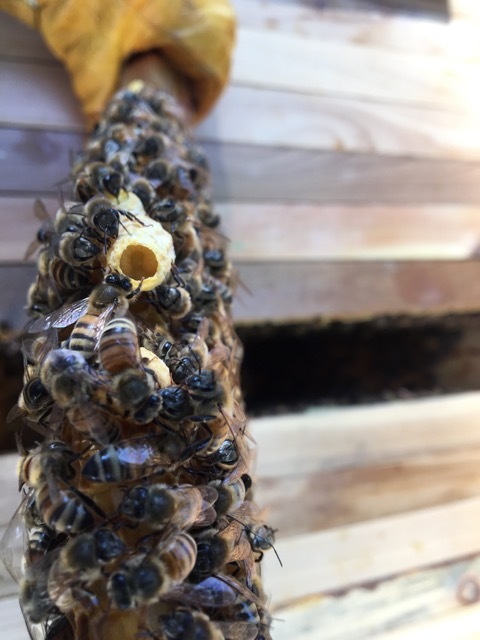 These bees seem to be replacing their queens this year. 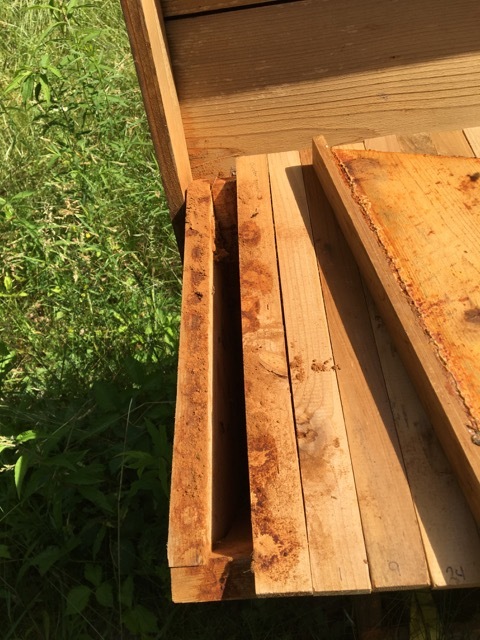 At this point I know of about six different hives that have done this. It makes me wonder what is going on this year. 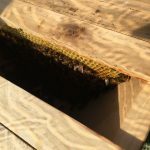 The bees are all new packages and they are not from the same place, so I don’t know what the connection is. I will keep checking in to this to see if I can find out anything more.